IME Ltd. and Oxigen Services India Pvt. Ltd. have announced the launch of Indo-Nepal Remittance services through Oxigen network in India and IME network in Nepal. Amid a special event held at Hotel Shangrila, Kathmandu, the services were jointly announced by IME Managing Director Hem Raj Dhakal and Oxigen Services Chairman and Managing Director Pramod Saxena. 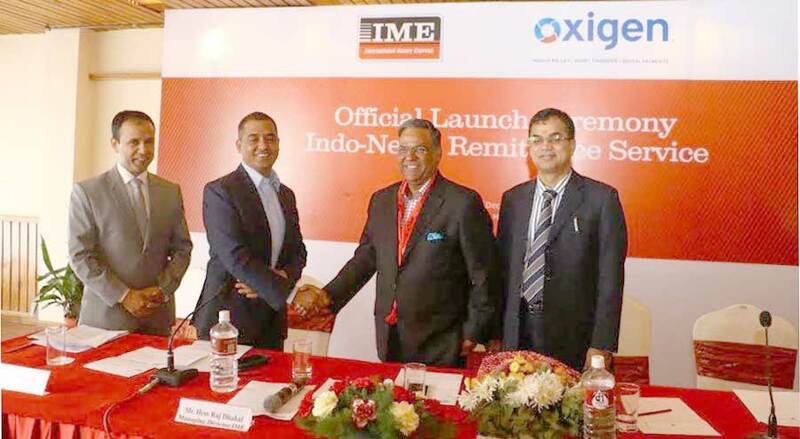 With the start of remittance operations between IME Ltd. and Oxigen Services India Ltd., nationals of Nepal residing in India, for employment, can now easily send money to Nepal through Oxigen’s 30,000 banking touch points of the total 2,00,000 Oxigen retail network locations, across India. The receivers in Nepal can receive the amount through more than 5400 agent locations of IME in Nepal. IME will provide account deposit facilities to these customers besides cash payment options. RBL bank in India and Global IME Bank in Nepal are the banking partners for fund settlements for Oxigen and IME respectively.